Cherry Berry Conserve for sale. Buy online at Zingerman's Mail Order. Gourmet Gifts. Food Gifts. 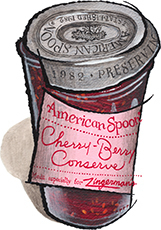 Cherry Berry Spoonfruit—like its sister jam, Black & Blueberry Conserve—is made by Justin Rashid's great company, American Spoon in northern Michigan. Tart Michigan cherries and sweet red raspberries, cooked when they're ripe in late summer, sweetened with a moderate amount of sugar. The result is nicely balanced between tart and sweet, with a huge, berry-bright kick. We've been selling loads of Cherry Berry Spoon Fruit for what seems like forever (or over twenty years). It has a large, loyal following. Feel free to join it.